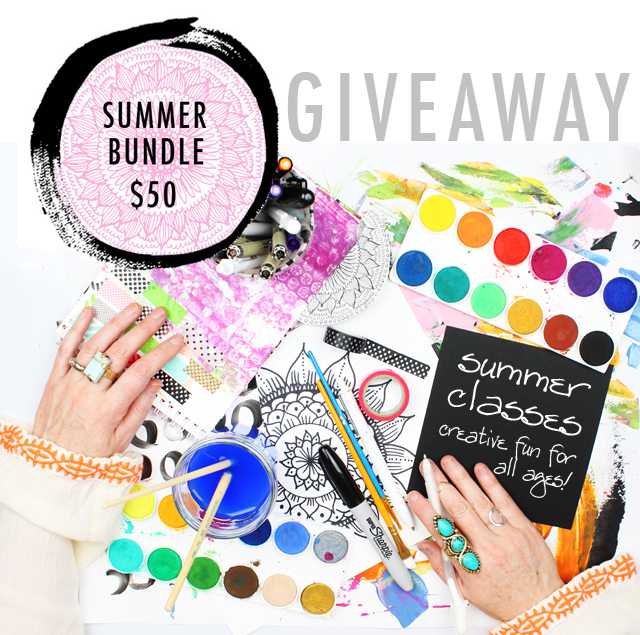 My summer series of online classes start in a couple of weeks and today I am giving away 10 of the Summer Bundles! What is a summer bundle? It is all four mini classes! You can read all about the mini classes below. To enter leave me a comment. Tell me something fun you have planned for summer. I'll randomly draw 10 people and announce the winners (as an update to this post) in the next couple of days! Individual classes each cost $15 or purchase the "Summer Bundle" at $50.00 to receive a $10 savings! And for the rest of the month I am offering an early bird discount of an additional $5 off. Been dying to take your classes. Maybe it's time to take the plunge! My summer plan is to clean up my studio and rearrange my supplies. Not quite fun, but I have to do it! I'd love to win this giveaway! Your tutorials are always so useful, so I bet your classes will be even more inspiring. Thanks for the chance to win! This summer I plan on doing some good old fashioned camping...in a tent! I will also be attending the great MN get-together...the always amazing MN State Fair! Thanks for the wonderful giveaway! Hope you are having a lovely summer! Going to try this again - my comment keeps disappearing on me! I plan on playing with my watercolors this summer while enjoying some of your classes (I've already signed up for some previous classes). I am keeping a sketchbook and paints on the kitchen counter so I can stop and play a few times during the day. Your blog is always inspirational for me! And Lucy is just adorable!!! Thanks for the giveaway. I am having my very first summer in California and on top of that, my brother and friend are going to visit me from Estonia. We have planned to do a hwy 1 roadtrip. So excited about that! Two selfish fun plans this summer are 1) taking a printed textiles summer school and 2) finally being able to set up my own art space - I can't wait! Thanks for the giveaway! Would love to win this! My plan for the summer is to paint outdoors, which I've never done before but always wanted to do. I've borrowed an outdoor easel and now I'm trying to gather courage to start painting. My fun this summer is going to all the local Fiestas and taking pictures to use in my artwork. Should be fun? Best of both worlds art & enjoyment. We just bought a house in the country! I am going to decorate it with and for my 4 years old daughter! This summer I have great plans! Together with a friend I will discover Norway by backpack. We'll sleep in forests and near glaciers and go hinking for days! Of course I bring my traveljournal wiyh me everywhere. My challenge for this year is to make no pictures, but draw everything. I wish you all a great summer!! I'm going to retire and spend time with the grandkids swimming, picnicking, hiking, sun bathing, whatever I want. Thanks for the chance to win a spot in your classes. Morning - ooh a bundle of fun classes - plans for the summer - trying not to work too much so I can spend time with said 14 year old would be a start. We've been given a long list of things he is going to have to know and understand for his English exams so hoping to create some artwork with him linked with that, these classes would be a fabulous addition to that as I'm trying to ensure it's not a summer full of Xbox! Can't wait to see what you and your family get up to! This year I have planned absolutely nothing. Previous years my vacantions were cramfull of trips with everyone, so this year I am just going to paint and finish all the projects I started on. Thanks for the giveaway! I plan to create some garden art with metal junk finds and to make all kinds of things for my SIL's newly renovated kitchen. Hi! Thank you for this amazing giveaway!!! My summer class ends at the end of July and I will DEFINITELY be signing up for one of yours after I get that off my plate! I live overseas as well. My parents are coming to visit. It is rainy season here, but we are hoping for a beach trip all the same! Hi, Alisa. I really love your art and I thank you for sharing with us. I am going to Italy in a couple of weeks for an art retreat with Jeanne Oliver and Stephanie Ackerman...8 days on Lake Como..art workshops, site seeing, and, even a cooking lesson. Very excited. Thank you again for your willingness to share. My plans for this summer; exploring Scotland. We moved from the Netherlands to this amazing country with lots of beautiful trials, castles, gardens and beaches (with seals :) ) I just hope it will stop raining. Thank you for a chance to win and I hope you and your family will have a super summer! My plan for the summer is coloring. I bought your coloring pages but work kept me busy, so I want to start coloring soon!!!! This summer I'm learning new crafts. I am so tempted by "Beautiful Backgrounds." :) This summer, I have plans to hike with my son, visit the beach as often as possible, tend to my messy little flower garden, and pick all kinds of fruit. This summer I plan to learn to recognize and name 50 trees. I will go to parks and woods around Paris with a botany book and a sketch book and "educate" myself to trees. Your classes sound like so much fun! I will be organizing and creating a dedicated art space. It would be great to add a little art into the mix! This is such a great give away! The mandala class: love it! I'm visiting one of the NP's in the Netherlands to bike around with my daughters of 7 and 5 in a carrier tricycle. I'm so looking forward to that! Such a great giveaway!! I plan to spend time on the classes I've already ordered...and on the summer bundle when you pick me! 😊. This will be in between play time with my 5 year old grandson. ❤️ Happy Summer! My summer plans changed greatly when my daughter had to have two spinal surgeries in May. They were her 3rd and 4th surgeries since October 2014. Unfortunately, we had to cancel our family vacation. Our plan now is to help her get better so she can attend college in August. Love your classes and your new coloring pages! Thanks for all you do! This would be a fun summer project to do with my daughters and the neighbor girls! We are busy decorating and landscaping our new house this summer! This summer I'm painting a large canvas with hot air balloons for a friend's classroom. I'm also hoping to get in some more sketching time! I love the classes you have planned. Great summer fun! This summer will be my first in my new home and I'm looking forward to beach combing and bike riding. Summer is a great time to create! Thank you for this opportunity to win your fabulous classes! My summer will be spending creating with my grandchildren. They love to doodle, paint, and every summer we tie dye tee shirts. Never a dull moment! This giveaway is awesome. Thanks for the opportunity to win it! Wonderful Give-away! After months of single digit temps and snow up to my ribcage I am thrilled to spend my summer just hanging out in the garden!! I'll travel to Sicily to visit a friend and immerse myself in the colours of that marvellous island. Thank you for this generous giveaway. Last year we were unable to put our boat in the water (the first time after 20 years of boating) and this year we are able to get it in the water and spend some precious time with nature. I have two little girls, 4 and 1.5. I am looking forward to spending lots of time on our land hunting for frogs, blowing bubbles and playing in the sprinkler! It is winter here but I am looking forward to the kids school holidays which start this weekend for 2 weeks including my oldest turning 12! These look like such fun! As I'm sure all your classes are. Thank you for a wonderful giveaway!! Not only will I be prepping my oldest for her first year of college, I will also be taking my son for college visits. I have bought new Winsor & Newton watercolors, Arches paper, and cleaned the rapitograph pens! I am getting back to painting this summer! It has been more years than I care to count since I held a paint brush!!! Thanks for the give-away! working through emptying the nest...last child headed off to school this past year so i'm learning to ride a motorcycle so my husband and i can go riding. lots of mini road trips. thanks for the chance to win these great classes! My summer fun will be making lots of art! Thank you for the chance to win! Your art and processes are super-inspiring, Alisa! Our plans have changed this summer with a bone cancer diagnosis for my mother-in-law who lives up the road from us. She is the best MIL in the world! We are going to spend most of our time helping her through her treatments, etc, but having the chance to work on your mini lessons would be wonderful. your online courses are super - packed with info, well presented, and loads of fun. Wow such an awesome giveaway. I really plan to take more classes this summer. I want to learn about so many different techniques. Thanks for the opportunity. Fun giveaway. My plans for the summer include a little art, hikes, and some beach time. We go to the most fun 4th of July party at our neighborhood pool. It's all very old school even though we live in (near) a big city. This summer I'm going to try to paint on large canvas. So far my biggest one was 50x70, and I'm so inspiredby your large works! I hope to be drawing lots using your Draw with Me class - many thanks Alisa for all the classes you do! It is the highlight of my world right now! Awesome! I am trying to paint every day. these courses would help me reach that goal. Thanks Alisa for the opportunity! The one thing I am taking time for, this summer, is to paint for fun! It's taken me 6 years to allow myself the time and I can't wait! I am going to be spending my summer creating artwork with my 9-year-old daughter Ava! We are going to be visiting art galleries, creating our summer mommy/daughter art journal, hopefully attend an art class together, and create collaborative artwork for our home. This summer we are not taking an extended vacation due to work so for fun we are going out in our little fishing boat as often as possible! It is the perfect way to get away while not leaving our neighborhood! Thanks for offering this cool give away! I like to declutter my closets, kitchen and especially art supply cabinet during the extremely hot summer months. Lots of hidden treasurers surface. I would like to create some stamps, practise doodling with your patterns and learn a lot with this great possibility to buy your summer classes for 50 USD. Thank you for the offering! You are my favorite artist! turning 60 and leaving my job this Summer - i plan to paint, read and create as much as i can while making some major life changes - LOVE your inspiration and would love to take your classes! getting a bunch of canvas pouches worked up for the fall season for a few shops. i am looking forward to some time with my new old sewing machine. We just finished our summer fun with a family reunion, and school starts in a couple weeks (is that fun??). Your classes would be a welcome addition to our summer! My 4 kids and I all admire your work! We are moving across the US to a place we've never lived before. No job planned...we are just wingin' it. It will be a great adventure! I'm also looking forward to being closer to the ocean. Thanks for the chance to win this giveaway! Planning on doing tons of sketching and watercolor painting! So excited about your Summer mini workshops! Just finished up my first year teaching art (prek-8) so this is my first "work-free" summer in 20+ years. I'm diving into house projects starting with painting our kitchen cabinets - at last! Thanks for all your inspiration - love your blog!! Lots of gardening and being outside as much as possible, and play time in my studio. Next week I plan to meet my best friend and her son in Portland, Ontario - a pretty riverside town here in Canada. We'll have a walk around and lunch on a lovely outdoor patio. Well something fun would definitely be taking your classes! I'd so love to! But we are heading out on a family vacation up north to the lake. Lots of fishing, eating, reading and relaxing with my family! Fitting in lots of crafts around evening bike rides and walks. Maybe some day trips to check out new places and get inspiration. We are going to visit restaurants to select for our sons rehearsal dinner in a city where we have never been. So many places to eat.....I guess we have to try them all. Summertime will be full of shakespeare in the park, movies with the grandsons, and music downtow . Other than that, as always, tons of creating time. This summer I am enjoying my college-aged kids who are home for the summer & going to visit family in Michigan - lucky me! This summer I'm teaching a few art classes to elementary aged kids at church and co-hosting a craft fair with a friend for all our homemade jewelry and art! It's going to be fun! Oh I hope so badly I win this! This summer we are mainly hanging out around NYC and trying out the various play grounds and going to the beach but we have our fingers crossed that we can make it out to Canada! We are visiting different restaurants for my son's rehearsal dinner. So many places to eat at .....yum. I'm going to Paris for a week ! Yihhhaaaaaaaaaa!!!!!!!!!! I hope to spend lots of time loving on our new, and first, grand baby. i'm going to be inventing all kinda green smoothies to et veg into my kids without them knowing it!! My biggest plan this summer is relocating from CA to NC. So excited! Besides working full-time, I'll be spending my summer weekends letting myself be free to be who I am and figure out what I want to do with my life. I need to make changes and find my happy place. I plan to watch my garden grow :) thanks for the chance to win your beautiful courses!!!!! I'm excited to spend some time this summer at my parents' cottage on northern Lake Michigan, where we hike in the woods, bike through farm land, and kayak in the big waters. My husband I and I have two awesome things planned for summer, we just took a trip to Yosemite, it was my first time there and it was incredible. Our second plans are going to Hawaii, I can't wait to swim in warm water and have really fresh food! I am also trying to be more active and do more walking everyday. This summer I just want to be outside in nature, with nature, loving nature, drawing nature, taking pictures of nature, and everything else nature! I absolutely love your blog and all your amazing tips and tricks and beautiful artwork! Thank you for the opportunity of this giveaway! Something fun.... hmmmm.... I plan on doing new stepping stones for a little trailer we just purchased down by the Jersey shore - When we made them for our house (years ago) I mixed our own cement and used the bottom part of a plant pot which was the perfect size ... we used magnet letters to spell out our name and added odds and ends that were an important part of us!!!! I think we need to do this again!!!! It was so fun and I think you even blogged about it once when you made them with your own daughter!!!!! That will be one of our "special family art days". My family and I have decided that we want to hike on trails and explore local waterfalls this summer. So far we have been able to find two beautiful waterfalls near our home. Really want to take all of your classes! We are planning a trip to South Dakota this summer. I am also learning how to draw and paint! Relaxing, hiking, cycling, doing lots of creative stuff, fishing and eating icecream! Been thinking about taking one of your classes. They look fantastic! I am taking my 15-year-old twin boys to Colorado for a week next month, and breaking in my new digital camera. I hope to have some really nice shots when we get back so I can blow them up and use them to decorate my new home. Your blog is so inspiring! I would love to take your classes. As for summer plans, my husband and I are going to Washington DC to geek out at all of the memorials and museums. Going to Eastern Oregon for crafting/art time with a friend. This is tradition for the last 15 years. These classes would be great to work on there! I'm thinking of buying an electric scooter or people mover for my birthday next week. Not the grey haired version. They are like the kind we had when we were kids only hold 200 lb people and have and battery operated electric motor. Sounds like so much fun to zip up to the shops or bank rather than using the car. And thanks for having a giveaway. Your classes sound great. We plan on visiting more of our local natural destinations and I'm going to go after my goal of "art every day." ohhh! Thanks for the giveaway, would love to win. I'm pretty new to exploring my creativity and learning new techniques with painting and especially mixed media. This summer I'm purposefully setting aside time to just be creative and have FUN! I am venturing back into wood burning this summer. Thank you for the inspiration! Thanks so much for this giveaway! This summer I'm planning on carving lots of stamps and filling up my sketchbook. I'd love to see how you create the mandalas, can't wait!! Two of my sisters and their families from Texas are headed my way. I can't wait to see them and to have some good ol' fashioned family time!! I'm exploring Montana until it's time to move on to our next big adventure. Hosting guests that we haven't seen in 6 years!!! Thanks for the chance to make more art. Summertime is the time to take my classic car out cruising! My kids are taking Jr. Lifeguards this summer and I am enjoying going down to the beach early & having some quiet alone time after I drop them, the sitting down the beach and watching them. Thank you for the giveaway chance, they all look wonderful! Happy Summertime! This summer I'm trying to be more open to adventures and to say yes more to unexpected opportunities. I have taken a couple of your classes and I love them! Actually, we just got back from a road trip to Maine (we are in Missouri)! Most of my family lives in Maine. The weather sure is different in Maine than in MO. I love it. My family prefers the warmer weather, go figure! Thank you Alisa! I'm getting a new driveway...I've been saving for years. Plan on having new garden space to plant and create. I get inspiration from your backyard...so cool! My summer plans are taking a trip to Mt. Rushmore with my nephews! I would love to take your classes! This summer I plan to be at the pool as much as possible. Thanks for your inspirational blogging...I just found you recently=) This summer I hope is one full of learning! I'm a homeschool graduate and hope to learn French, oil painting, a couple new classical pieces on piano, read lots of books, and spend time with my family of 8 (besides me) this summer! Getting a new puppy. Thanks for the opportunity to win not just one but four of your classes. I am planning a trip to Cape Cod, the doing some artwork and relaxing before heading back to teaching in September! I plan on painting, organizing my studio, planning my Fall Art Classes, spending time with family, hit the beach, and so much more!!! Thanks, Alisa! This summer, I am in full nesting mode as we prepare for our first kid. Hi Alisa :) This summer I am moving my sewing studio that has taken over our living room and dining room. We just put up a yurt in the backyard and it is going in there! Hooray. Thanks for the chance at winning your Summer Bundle. Thanks for your always wonderful blog. Great giveaway!! This summer I'm looking forward to my friend's wedding in Germany. I am going to Plockton on the west coast of Scotland (where I live) with my husband, children and my standard poodle. I've not been there before so I am looking forward to it and also finding the time to do some painting. Thank you! I'm moving this summer. That's fun right? Actually we're hoping to turn it into an extended trip up the coast from Santa Monica to Seattle, complete with sketchpad and watercolors. We'll definitely be spending some time with friends on the Oregon Coast. I have only one vacation planned. I'm taking one of my daughters and her two boys to visit my parents near Yosemite National Park. There will be four generations together. We will play in the creek, go to the Loggers Jamboree, swim at the lake and have the best chocolate malts at a little shop that's only open in the summer. We don't have a lot of money for elaborate summer plans but our favorite things to do are simple and usually happen in our backyard: grilling and eating on the patio every night, gardening, playing baseball or soccer with the kids, making s'mores, and my favorite - fixing up a cute little play corner for the kids with painted rocks, stepping stones and re-painting a hand-me-down wood playset we just received. This summer I'ill too visit my mother in Italy!! Thank you for the giveaway. creating some art,spending time with my sons and the extended family, learning some new techniques are the plans for summer this time !! love your blog and my daily visits to your creative space !! Thanks for the giveaway, would be like a dream come true learning straight from you ...Hugs from India !! My summer is filled with making memories with my 10 grandkids. Swimming, camping, making up plays, art projects, baseball games, park time, you name it we love to be together> We are blessed to live close to one another! Love your ideas to do with them. 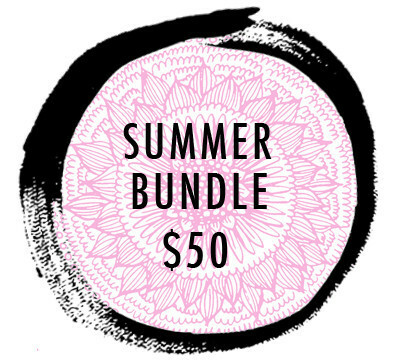 Summer bundle....how AWESOME!!! I hope to create as much as possible this summer. Working full time it's hard, but with the kiddos out of school hope to have some free time! But high on the list for my family is CAMPING!!! We love the outdoors and it always gives me incentive to create!! Hope your summer classes will be full of fun and thanks for the opportunity!! I'd love to win this giveaway! Looking forward to having 2 of my boys coming home for a visit in August. I'm just enjoying my time reading, writing blog posts, making new crafts and exploring new places! Since I homeschooling my kiddos...my summer plans include lots of time in my studio. I use the time to create new products and write and illustrate storybooks that will sell during school months. I would love to be able to teach this to my kids!! You are so kind and generous to be giving away such a wonderful gift of learning!! Thank you so much for the opportunity!! We are heading to Seaside this summer! we are moving this summer so looking forward to setting up my creative space! I am going to retire in August! Woo hoo! Until then I plan to find time to walk on the beach on the weekends in the morning and add to my "You Me and the Sea" journal I started with your class. Thank you for this opportunity to win some of your fabulous classes! This summer I'm hoping to just reclaim my life and creativity from a variety of frustrating, draining situations. I'm hoping to take some fun classes, read some good books, and just generally remember what it is that I love about my life. Love your classes, and have been having loads of fun with the coloring pages so far! This summer, when we're not at the pool or lounging about with our love-hog kitties, my girls and I will be drawing mandalas to use in my yoga classes this fall. I am working on 100 canvases. So fun. I've been so. Creative lately and have finished 8!! My summer includes lots of lemonade and shade with my sketch book. I'm planning on working with my art again this summer. This summer, I am hoping to do lots of hiking and take my sketchbook and paints with me. This summer I have planned to see my dad who lives a couple of hours away. And I will be working in my art journal while at home and taking a travel journal even if I just go to the park! Going home for 2 weeks to visit my family outside of Philly. It'll be hot, humid and sticky but we'll find stuff to do. This summer we're going to Portugal to meet my niece!! big project, Getting the House In Order, then for FUN I am going to Cape Cod for my show reception! Best of the best - I'm going to spend time visiting my grandchildren and immerse myself into ages 2 and 6. The playtime never ends, for them or for me! I'm having a memory moment...summer holidays spent colouring under our huge weeping willow tree. Playing with these courses would bring a lot of that glorious feeling back! Vancouver is awesome in the summer, and I plan on spending a lot of time at farmer's markets, and summer festivals! Thanks for this giveaway! This summer, we go to the south of France and I will take my sketchbook(s) and art supplies with me. And I will see what I will do in the next half of the year for our second bookpagechallenge. No big plans for the summer: I love the slow pace of it and enjoy every minute of it. My big plans will come for Fall and Winter, when I'll miss Summer too much! My husband retires this summer so we plan on taking a well earned rest!